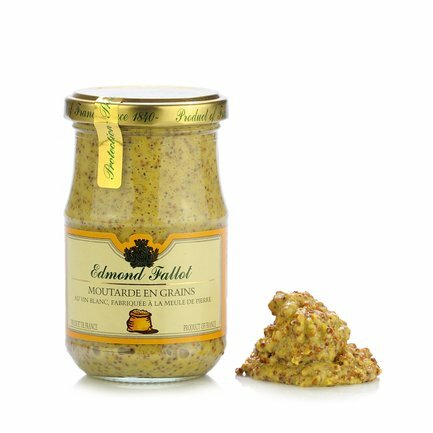 Mustard seeds, white wine, vinegar, a bit of salt, sugar and spices: this delicious mix of ingredients is the basis for this delicious grain mustard by Edmond Fallot. A delicious and versatile sauce, it can be combined with meat and fish main courses or used to create fantastic recipes and delicious finger foods. Ingredients Water, mustard seeds, white wine (with sulphites), distilled vinegar, salt, mustard bran, sugar, spices. ALLERGENS: sulphites (potassium metabisulphite) and mustard For more information on product labels, please contact our Customer Service department. The information on the labels of the products may vary for reasons beyond our control, therefore, there may be discrepancies between the information on the site and that on the products delivered. Please always check the information on the product before consumption or use. Since 1840, Edmond Fallot has been synonymous with experience in the production of mustards and conserves. The company has been able over time to combine constant technological innovation with respect for artisan tradition and the most ancient recipes. Edmond Fallot is set apart due to the attention placed on protecting the environment through the correct disposal of waste and respect for nature. The use of only selected ingredients is the mark of distinction of an excellent company.